When it comes to designing for mobile devices, nothing beats seeing your work on the device you made it for. But before any code is deployed, your best bet is to rely on the highest quality mockups you can find — They’ll let you take advantage of any given product, both its strengths and its weaknesses. Designing within your constraints saves tons of time in the longrun, and clients (along with nearly everyone else) will certainly prefer a fully-polished look. Most importantly, as mobile devices like smartphones and tablets continue to grow in popularity, everyone from UI designers to web developers should be keeping these new screens in mind. Here’s 13 Photoshop PSDs and Vectors for iOS, Android, and Nokia devices. Pick your favorite and put them to work! 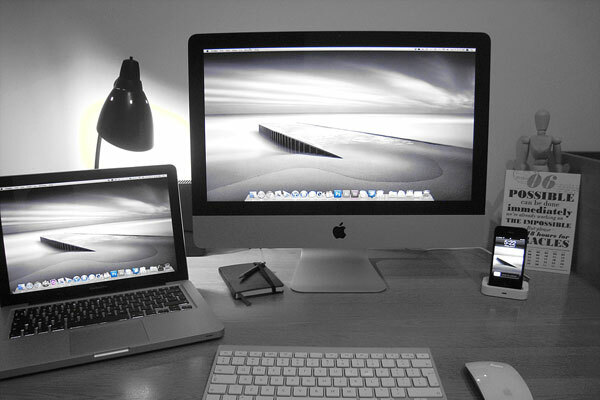 This beautiful set by Arnas Goldbergas features iPhone4/4S mockups, along with a Macbook Air and an iMac. From what I can see, this set of vectors is nearly perfect. Here’s a second set that includes the iPhone in white. While you’re at it, here’s a GUI kit by Mercury Media. This iPad 2 mockup comes in both colors, with PSD, PNG and ICO versions. Here’s a second mockup in black as a backup. An iPad GUI Kit in PSD by Raw Apps. Snag this iPod Touch 4th Generation PSD, created by kampongboy92. Particularly useful if you’re releasing on all iOS devices. The Galaxy Nexus is one of the most talked about Android devices at the moment. The HTC Sensation 4G is another popular phone to design for. This mockup isn’t perfect, but is usable. Here’s a comprehensive set of Android GUI elements. Unfortunately, Android-based devices come out much more often than Apple, since the Android OS is spread across multiple manufacturers. We’re on the lookout for other recent phones, as well as Android 4.0 mockups. Send us what you’ve found via the comments! Nokia’s brand new Lumia 800 is quite gorgeous. Take a peak at the line if you’re not familiar. HTC’s Titan is another WP to look out for. Lastly, here’s a generic option for WP7. Do you have any favorite mockups that you rely on? Have you ever had to make your own? Please share them below and we’ll add more to the list!